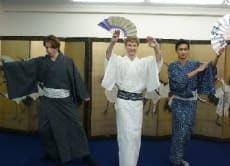 I will teach you how to wear Kimono and dance the Japanese traditional dance. You may discover that wearing kimono makes you feel differently, compared to your usual and most formal clothes. The wearer knows best about the feeling of wearing Kimono, and I would like to share this special experience with you. The same goes for Japanese traditional dance. I hope that you will come to appreciate and enjoy wearing a kimono, and dancing the Japanese traditional dance. If you are in Japan, I recommend that you should experience our traditional culture!